Looks like the Wildcats are turning to Stanley "Boom" Williams at running back. The new Kentucky Wildcats depth chart is out with a huge matchup vs. the Georgia Bulldogs coming in Week 11. True freshman running back Stanley “Boom” Williams is the No. 1 RB on the newest depth chart. True freshman Garrett Johnson is also now one of the four No. 1 receivers. Now, I don't how true this depth chart remains throughout the week preparations. When I first saw this yesterday I figured that JoJo Kemp kid we'd heard so much about after their game with South Carolina was injured. Kemp had a field day in the fourth quarter against the Gamecocks, albeit mostly from the Wildcat formation. But I can't find any injury news on Kemp, who despite still leading the team in rushing has seen his carries dwindle to next to nothing the last few games. Perhaps they're sending a message to the older running backs on the roster. More likely, this kid Williams has earned this chance. He's a four star talent out of George Walton Academy over in Monroe that Kentucky offensive coordinator never really considered redshirting. 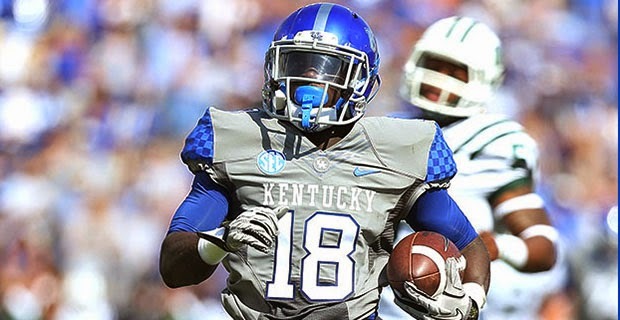 A four-star recruit according to the 247Sports Composite, Stanley "Boom" Williams quickly silenced any talk of a possible redshirt season during his first preseason camp at Kentucky, though offensive coordinator Neal Brown declined to call him "Boom" until he earned the name on the field. In his second collegiate game, Williams scored on a 53-yard touchdown run. He briefly gave Kentucky the lead in overtime vs. Florida with a highlight-reel 25-yard touchdown catch-and-run in which he cut back across the entire width of the field. After the game, Brown finally acknowledged Williams had earned his "Boom" nickname. So at least as of this morning, sounds like we might see a motivated young running back going up against a defense eager to prove the Florida game was a fluke.